Forty-eight years is a long time. And an even longer time to miss the only woman he ever loved. Sean hadn’t noticed a tour group entered the room, but then he heard a woman’s voice. The sound of her voice was like the glissando of a harp, but it cut through him and shifted the arrows of time arcing to an age of innocent lost dreams. He moved to the back of the crowd. Standing before the paintings he listened as the silver-haired, spectacled woman spoke in a voice two steps above a sentimental whisper that drew members of the tour group close to her. Forty-eight years is a long time and even a longer time to miss the woman you love. 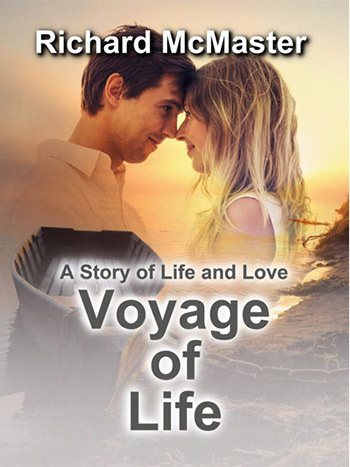 The Voyage of Life story is told as the Robert Cole Voyage of Life paintings are described by the woman he loves: Childhood, Youth, Manhood and Old Age. The paintings become a metaphor for Sean’s life–the verdant landscape and calm waters of childhood become turbulent in youth and then early in manhood the shores turn rocky when he believes his one true love left him for another man. The Impetus for the Voyage of Life was the Voyage of Life Paintings of Thomas Cole. The paintings depict, Childhood, Youth, Manhood, Old Age, which provides a metaphoric depiction of the four phases of the main character’s life. The story follows a timeline of events, which were shaping the world and the lives of people who came of age in the sixties. The paintings reside in the National Museum of art. In my career, I made a number of trips to Washington D.C. and when I found the time to visit the museum and view the paintings, I was struck by how well they reflected the stages of our lives. Anyone looking back on their experiences and the painting’s depictions, it is easy to feel we live four different lives – childhood, youth, manhood and old age. The paintings and a brief summary can be found under the heading Voyage of Life Paintings.